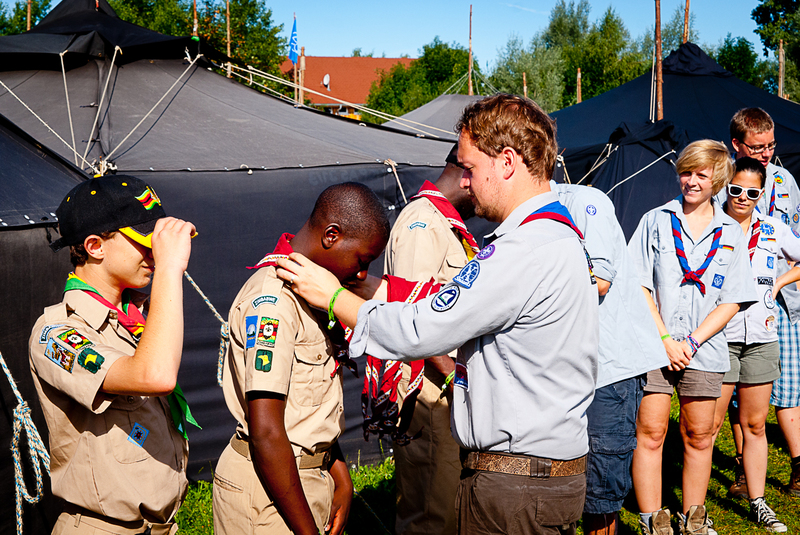 During the regional camps of the VCP in Württemberg and VCP Rhineland-Palatinate/ Saar (RPS) in summer this year, 5 scouts from Zimbabwe took part at each of these camps. The Africa workgroup of the VCP association managed to set up this visits together with the host groups of Dettingen (Württemberg) and Wachenheim (RPS). “In the middle and yet beside” was the theme of the VCP in Württemberg regional camp taking place in southern Germany with more than 950 Guides and Scouts – thereof around 180 international Guest from the UK, Sweden, Czech republic, Indonesia and some other countries. Five scouts from Zimbabwe Scout Association jointed the camp together with their partner group from a small town in Württemberg Region called Dettingen. “This was the best adventure in my life”, said Anari Hamunyari, 14, from Zimbabwe. She was pointed out from the national board in Zimbabwe to join this experience. The groups had an unforgettable time during the camp with different activities, like cannoning, a visit of Munich, workshops and sports activities on the camp site. After the 10 days of camping the Zimbabwe scouts went to Dettingen to spend some more days together with their partners. Within this time they visited the town of Stuttgart, hiked on a mountain in the surrounding of Dettingen and finally had a barbecue evening as farewell evening with all scouts and families taking place in this partnership exchange. Hosted by the VCP of Wachenheim, a second group from Zimbabwe visited the regional camp of the VCP Rhineland-Palatinate/ Saar. Before the camp the group stayed for four days in the hometown of their hosts and enjoyed the region. Hikes to different spots in the surrounding, games, a church service and the visit of the technical museum of Speyer have been on the schedule before both groups caught the train to northern Germany to take part at the regional camp in Tydal close to the border to Denmark. Within the next ten days, the regional camp “Landaktiv – das strahlen wir aus!” (“Region active – this is what we send out”) hosted more than 550 guides and scouts from six different countries. The groups enjoyed the camp with the program, lived together and had a great time together. Valeria Ileana comes from Italy and she is Assistant on External Relations and Funding at the European Scout Office. She is following the Region's work on External Relations and Funding.